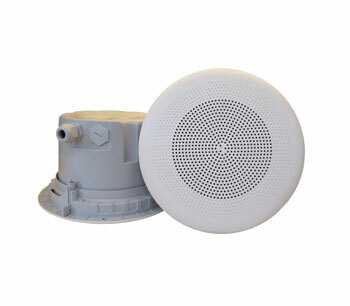 These are flush-mounting ceiling loudspeakers, mounting directly into a false/suspended ceiling. A multi-tap transformer is fitted to the line voltage models that allows adjustment of sound output. One model has 'a non-shedding cone' so is 'suitable for use in clean room environments'. Another is weatherproof and 'suitable for installations such as offices, retail outlets, airports, and hotels'. 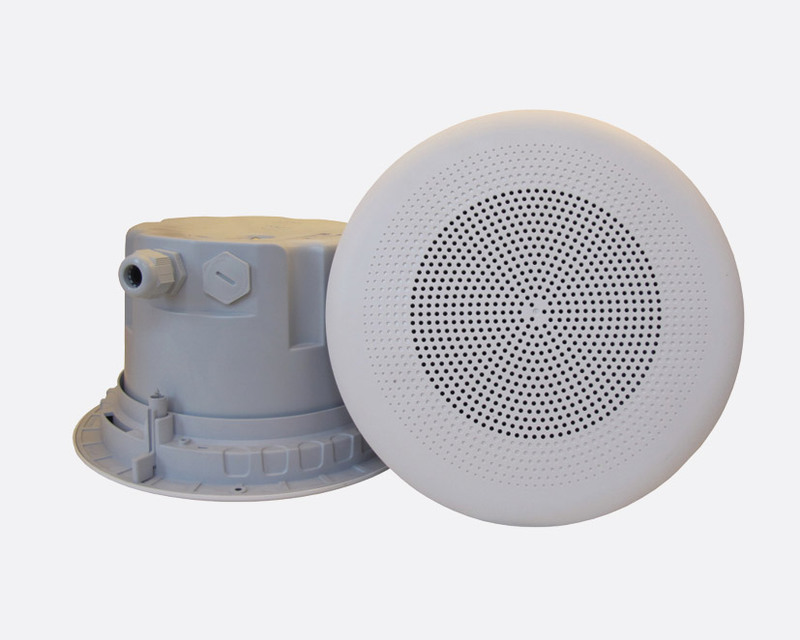 The DNH BPF-560CR(T) is a 5 inch, 6 watt, fast fitting, flush mounting, clean-room, ceiling loudspeaker with a maximum sound pressure level of 95dB(A), suitable for installations such as research facilities, pharmaceutical manufacture and food preparation. This loudspeaker is fitted with a non-shedding cone suitable for use in clean room environments. With a frequency response of 70Hz to 12kHz and a dispersion angle of 170 degrees at 1kHz, this loudspeaker features dual M20 gland entries in the rear dust box and a large termination chamber for ease of installation. Cable termination is by spring-loaded fast connect terminals. The BPF-560CR(T) mounts directly into a false/suspended ceiling. A multi-tap transformer is fitted to the line voltage models that allows adjustment of sound output. The DNH BPF-660(T) is a 6 inch, IP54, weatherproof, 6 watt, fast fitting, flush mounting, ceiling loudspeaker with a maximum sound pressure level of 100dB(A), suitable for installations such as offices, retail outlets, airports, and hotels. With a frequency response of 170Hz to 20kHz and a dispersion angle of 120 degrees at 1kHz, this loudspeaker features dual M20 gland entries in the rear dust box and a large termination chamber for ease of installation. Cable termination is by spring-loaded fast connect terminals. The BPF-660(T) mounts directly into a false/suspended ceiling. A multi-tap transformer is fitted to the line voltage models that allows adjustment of sound output. The BPF-660(T) is Bureau Veritas approved for marine installations. Power: 6w rated, 10w max. 6w rated, 20w max.